The The DynoTune TEMP Gauge is the smallest plus one of the most accurate TEMP Gauges available. The superior Digital display is available in Red, Blue or Green. The displays are so good they even work great in direct sunlight! . This gauge is very small and mounts anywhere. 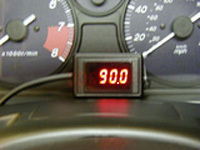 The DynoTune temperature Gauge will display the temperature of any fluid or air. The Gauge will display degrees Celsius with resolution to 1 degree. Why use a Mechanical(our competitors) gauge that does not even have temperature compensation? ours uses state of the art Temperature compensation so on hot or cold days the temperature will always be accurate! The kit Comes complete with Gauge, probe, Directions, C to F Temperature conversion chart and associated hardware needed for a clean installation. The probe comes with a Screw on bung (1/8" NPT). Small Package Dimensions of Square Gauge: L=2.12" D=.6" H=1.37"